Nant Thandar Aung from the Rangoon based Karen Women Empowerment Group (KEWG) is the winner of the 2012 Pado Mahn Sha Young Leader Award. 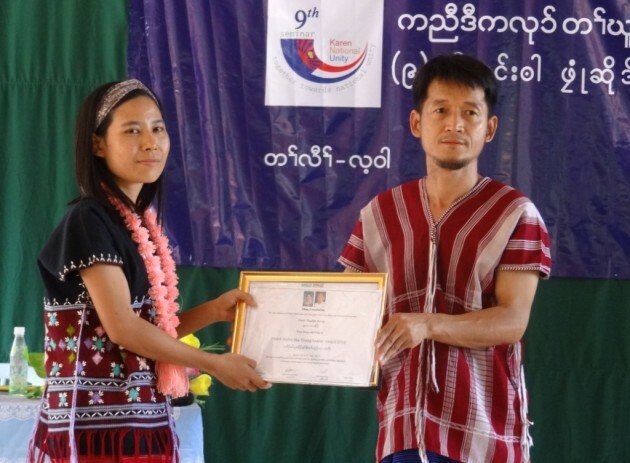 The Phan Foundation announced its award winner at the 9th anniversary of Karen Unity Seminar held in the Karen National Union’s Hpa-an District on May 31. Saw Say Say Phan presenting the award to Nant Thandar Aung said. Nant Thandar Aung has been with KWEG, a Karen women group working on social and cultural issues, since 2008. Currently, she is working as an organizer on KWEG’s women empowerment project. Nant Thandar Aung has a leading role working on opening learning centers, libraries for computer and vocational training. Nant Thandar Aung has been busy working with a law consultant group on the trafficking of women and domestic violence issues and is giving assistance to the on-going peace process between the government and the KNU. In 2008, Nant Thandar Aung joined the Karen Women Empowerment Group as a relief worker and helped people in Burma’s Irrawaddy Delta left destitute by Cyclone Nargis. Nant Thandar Aung work for her community continued as a project manager for KWEG’s anti-human trafficking program where under her leadership, KWEG rescued young women from delta area that had been trafficked into China and Thailand. In 2010, Nant Thandar Aung travelled to Mu Se, on the Burma-China to rescue 20 young Karen women. Nant Thandar Aung is credited with having a leading role in the promotion of women rights and human rights through campaigns, training, and public education. Nant Thandar Aung was involved in organising a Human Rights exhibition in Karen State in 2011 and the Rangoon International Day of Peace in 2012. The Director of the Karen Women Empowerment Group, Naw Susanna Hla Hla Soe, in her nomination letter for Nant Thandar Aung said. KWEG was formed in Rangoon in 2003 and have branches offices located in Taungoo Township, Pegu Division, and Hpa-an Township in Karen State. Nant Thandar Aung explained how she felt at the award ceremony. The children of the assassinated KNU leader, Padoh Mahn Sha Lah Phan’s, formed the Phan Foundation. Mahn Sha’s four children, Saw Say SayPhan, Nant Bwer Bwer Phan, Nant Zoe YarPhan and S’ Lone Phan created the foundation to dedicate to the memory of Padoh Mahn Sha Lar Phan and his wife Nant Kyin Shwe. It is alleged that agents of Burma’s military dictatorship gunned down Mahn Sha’s at his home on the Thai Burma border on February 14, 2008. The winner of the Padoh Mahn Sha Young Leader Award also receives a grant of USD $2,000. The previous award winners from year 2008 to 2011 were Naw Paw Ka Blah Htoo from Nyaunglebin District, Saw Nyunt Win from Pupum District, Naw December Paw from Megui-Tavoy District and Saw HtooHtoo Eh from Dooplaya District. The fifth award winner Nant Thandar Aung is the first winner basing inside the country.